Dive Journal: Time to rock and roll!! The Ocean Motion is a significantly faster boat than yesterday's Natural Mystic, (a snorkelling trip to Laughing Bird Cay) and James expertly rams us through the water on an exhilarating one hour ride. He especially guns the boat through the calm waters surrounding the inner cays we pass, including such odd sounding ones as Long Loco Cay, Mosquito Cay, Hatchet Cay, and Little Water Cay. Our destination is the Silk Cays, a collection of 3 or four tiny cays just inside the barrier reef wall about 25 miles ESE of Placencia. We finally arrive at one of the Silk Cays, a great little island maybe a bit more than an acre in size, sprinkled with coconut palms and dusted with beautiful white coral sand, the basis of the islands' name. The Silk Cayes are owned by the Belizean government as public lands, and are therefore open for use to everyone. At first, we are not alone, as the ritzy looking Auriga II dive boat is also anchored offshore, with perhaps 10-12 guests plus crew. A few are onshore, but most are still on the boat, apparently readying for a dive. We anchor and set up a "camp," using our ice chest and a few towels. The Auriga II eventually loads up and pulls away, and James points out that those guests are paying a WHOLE lot more than we are to be in the same place. Johnny and Janel are suited up in their Lycra skins for sun protection, and begin playing around in the mild surf on the tiny beach. James, Linda and I board the Ocean Motion again, pull anchor, and start out to our dive site. We are then engaged by one of the most memorable specters of the trip. Picture the image from the stern of the boat as we gun away from the tiny island growing ever smaller in the distance, with the majestic Caribbean Sea surrounding it, with our two children alone on the island and playing on the beach without a care! James slows the boat as we approach the dive site and studies the bottom hues for the right location. We are diving Silk Cays' North Wall today. A quarter mile away, the >Auriga II is slowly motoring along following bubbles - apparently their divers are already underwater and making a drift dive along the wall. As the three of us ready our scuba gear, we note that some Auriga II divers are already exiting the water. We are excited about doing this dive, because it is our first fully recreational dive. No trained seal tricks! In some sense, we feel as if we are finally enjoying the fruits of our PADI training labors. We plan a 40 minute, 70' deep dive profile, and follow guide James to the bottom. The coral wall here is once again stunning, too beautiful to be described. There is a wild assortment of brilliant sponges and coral forms, and tons of reef fishes, and I attempt to take the last few dive camera pictures we have left, using the same camera we used for Glover's dive #2. James has brought both a spear and a long handled gaff, and we follow his lead along and down the face of the coral wall. I notice that my depth gauge sticks at 40', but am not concerned about it since I am following James and staying with Linda. Linda and I periodically stop to examine various coral arrangements and fishes, while James is busy studying beneath crevices and overhangs. Before long, our attention swings to James as he holds out a HUGE-looking lobster on the end of his gaff, tail pulsing wildly. Lunch! Cool! Way to go, James! 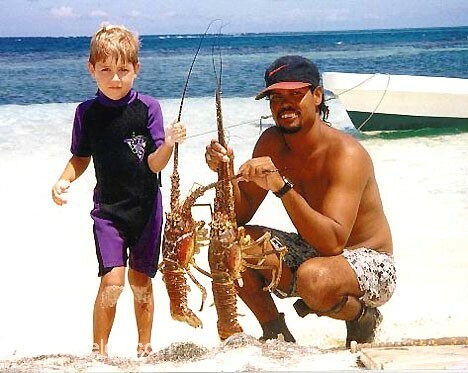 The lobster dies surprisingly quickly, and James simply holds onto it by clutching one of its long chitinous feelers. Continuing our dive, we all get a good look at a beautiful spotted moray eel at one site. James persists on his quest for lobster and gaffs a second one, which he gives to me to hold as we continue our tour. We enter a smallish cut in the wall, and James pokes around a large coral boulder there. This time, James gaffs a HUMONGOUS lobster! When he does, the head of a HUMONGOUS green moray eel emerges from the same boulder, perturbed. Its body is 10" in diameter and it extends about a yard from its lair, working its evil-looking jaws defiantly. Wow! The dive is over all too soon and we ascend up the anchor rope carrying our bounty. As we do our safety stop at 15', I weakly hope that sharks are not attracted by lobster meat. On the ride back to the cay, Linda mentions to James that Janel will probably not want to eat lobster, so James slows and then stops the boat about a half mile from the island and drops anchor. James grabs his spear gun and asks if we want to watch. Linda is tired so I jump in with James and we begin a surface swim to locate suitable fish. James' spear gun is actually just a sharpened steel rod maybe 28" long with a hole at the rear, a length of PVC pipe, and a length of rubber surgical tubing to act as an elastic sling. We locate a red snapper sculling at the bottom, about 25' deep. James first hyperventilates, then dives to a point just over the fish. The fish doesn't react as long as James is not at its same depth, and James pulls back the spear and carefully aims at the fish. This is a very tricky operation, as the target of the fish from overhead is little more than a slender profile. Compound this fact with the parallax error between arm and eye, and the distorting optical effects of the water. James' first shot rips through the fish's mouth, and the frightened fish skitters away about 10 yards, then stops again at the bottom. James fins over to the fish, takes position again, carefully takes aim, and lets the spear fly. Wait! Something is missing. James hasn't taken a breath - amazing! This time the spear misses again, and the frightened snapper swims off and takes refuge beneath a coral boulder. James finally comes up to take a breath, and we swim over to the boulder. James then dives and, with a combination of persistent spear shots and gaffs, finally snags the fish, which he hands to me on the gaff. We continue our surface swim in search of more fish. James successfully spears two more snappers, one of them pretty large, maybe over 2 pounds. The second fish requires only a single perfect shot through the eye, the third takes only two shots. We return to the island and anchor the boat. Janel and Johnny are almost oblivious to our return, having had the run of the island for more than an hour. As we jump off the boat, the Auriga II divers also return to the island for a short break. Several of them come over and look on at our lobsters and fish. James whispers not to specifically mention that the lobsters were bagged using scuba equipment. He notes that gaffing lobsters while wearing scuba is considered unsportsmanlike by some divers - it is simply too unfair to the poor lobster. James indicates, however, that it is certainly a legal practice here and is simply the way he runs his charters. The Auriga II leaves about 15 minutes later. James meticulously skins the snappers and prepares the lobsters on the beach while the children look on. Linda and I merely lie back and rest after our dive, enjoying the simple splendor of the tiny island. James then produces a number of seasonings, including green and red bell peppers, onions, butter, and soy sauce, and places these and the seafood individually in foil pouches. The one huge lobster tail is easily 1-1/2 pounds all by itself. James gathers up a small pile of coconut husks from around the island, then uses gasoline from the engine to ignite them. He produces a simple metal grate which he places across two coconuts, and shields the blaze beside the trunk of a palm. The snapper is so fresh that Janel sees that its jaws are still moving as James places it on the fire. We are hungry and the food is FANTASTIC! We easily have enough for an all-you-can-eat feast of the very freshest seafood obtainable.